I love a reason to sew for my boy. 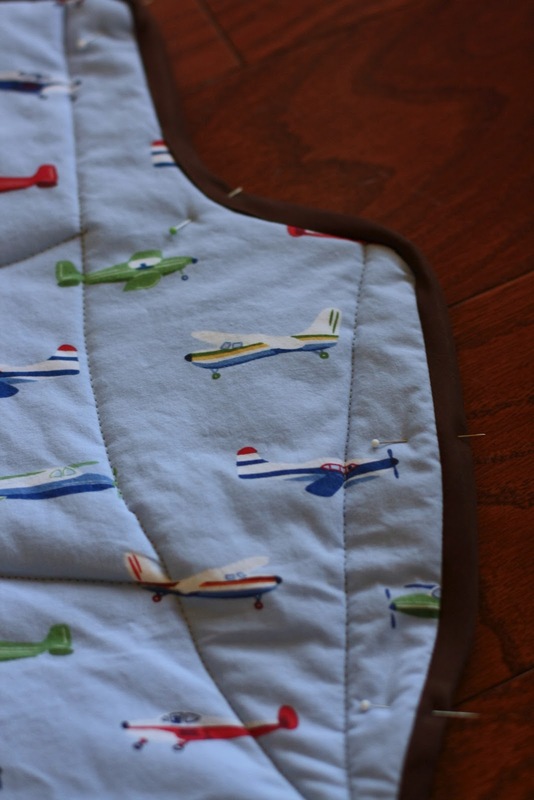 For the last two years, I've made him a jacket (here and here). But I'll admit - it's hard for me to get jazzed about sewing typical boy clothes - pants or shirts. And frankly, he's not begging me to make them either. He was happy to get these pants, but then didn't wear them often. Outside of making him a shirt like this, I don't think he cares much what he's wearing. 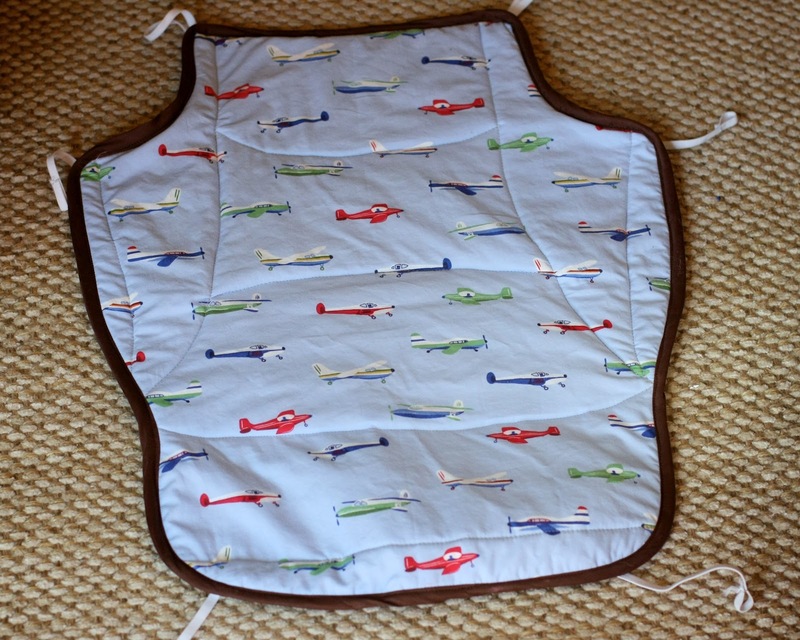 But when I saw his grimy, old car seat cover laying in the laundry room, I knew it was time for a new, mama-made version. 1. 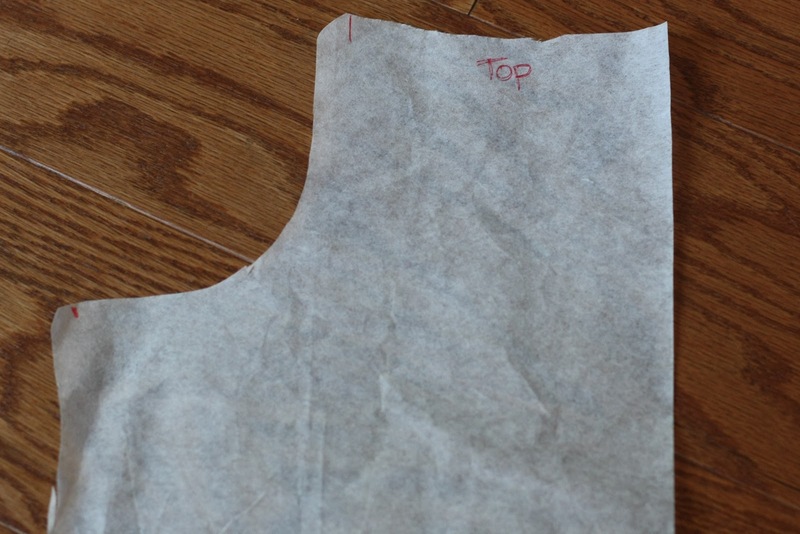 Start with some Swedish tracing paper. If you walk away with only one thing from this tutorial, let it be the awesomeness of Swedish tracing paper. 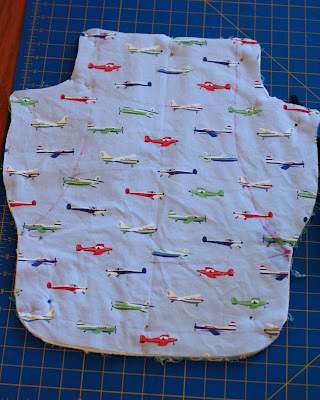 I learned about it here when I was new to sewing and now I couldn't imagine using anything else. Fold your old car seat cover in half and trace its shape. 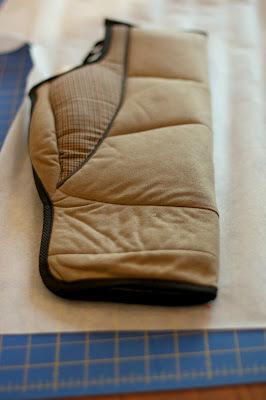 Be sure to stretch the cover so that it lays completely flat as you trace it. 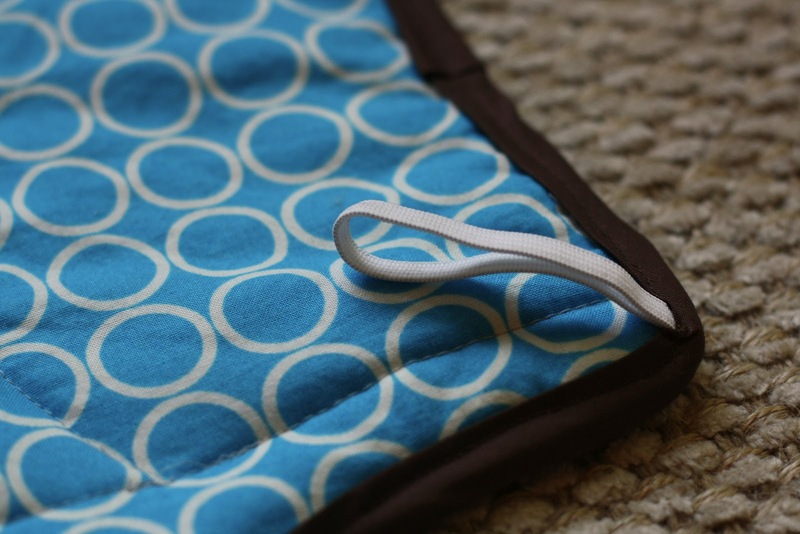 Draw notches where your elastic bands connect to your car seat cover and label the pattern with 'top' and 'bottom' if you are using a directional print. 2. Using the pattern you just created, cut out the fabric for the front and back of the car seat cover, as well as two layers of batting. Your fabric will be folded in half, with your fold line placed on the fold. 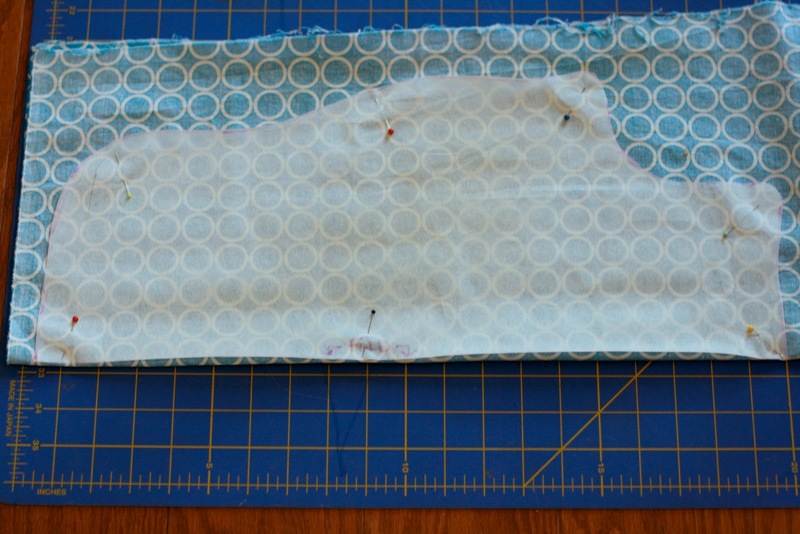 If your fabric is directional, be sure to double check that your fabric is facing in the right direction, or you might cut out your fabric upside down. 3. Make a sandwich with your materials. 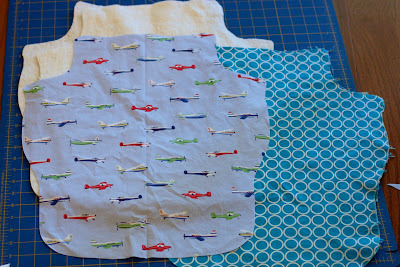 The back fabric will go right side down. Place the two layers of cotton batting on top of your fabric backing. 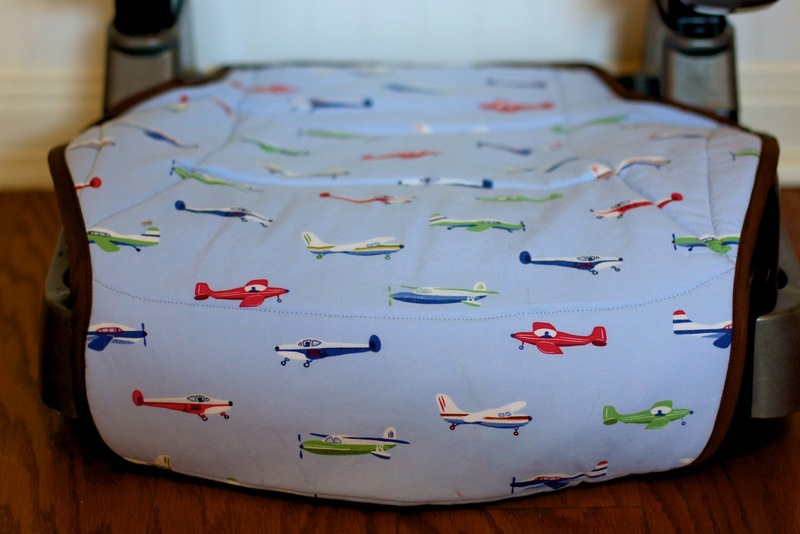 On top of that, place your front fabric, right side up. 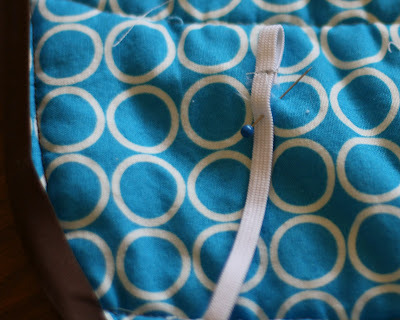 Pin together. Using a fabric pen, trace out a design for quilting the layers together. 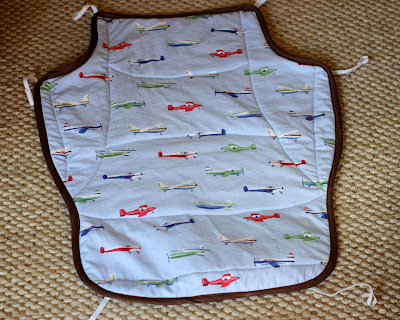 I was boring and followed the design his old car seat cover had. 4. 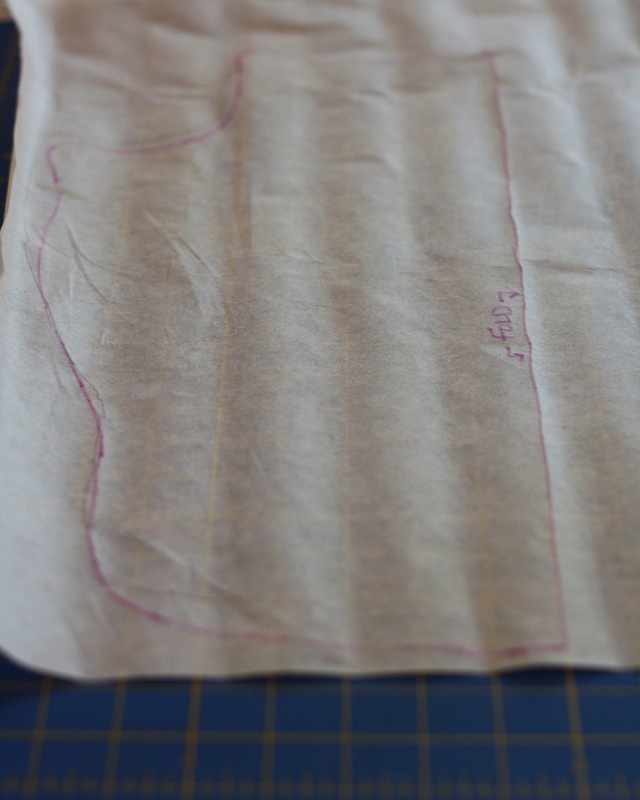 Starting from the center and working your way out, sew the four layers together along the lines you just traced. 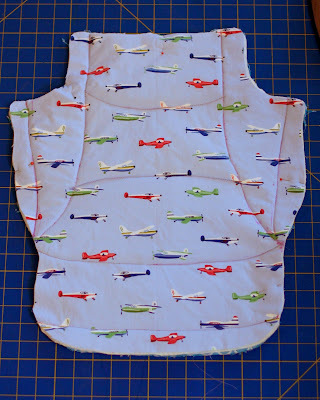 You might need to increase your stitch length given the thickness of this project. 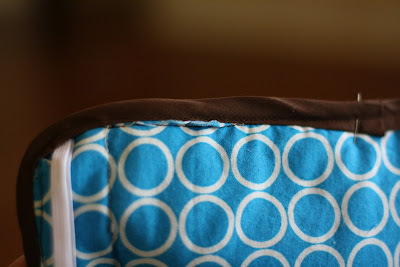 Baste around the other edges with a 1/4" seam. 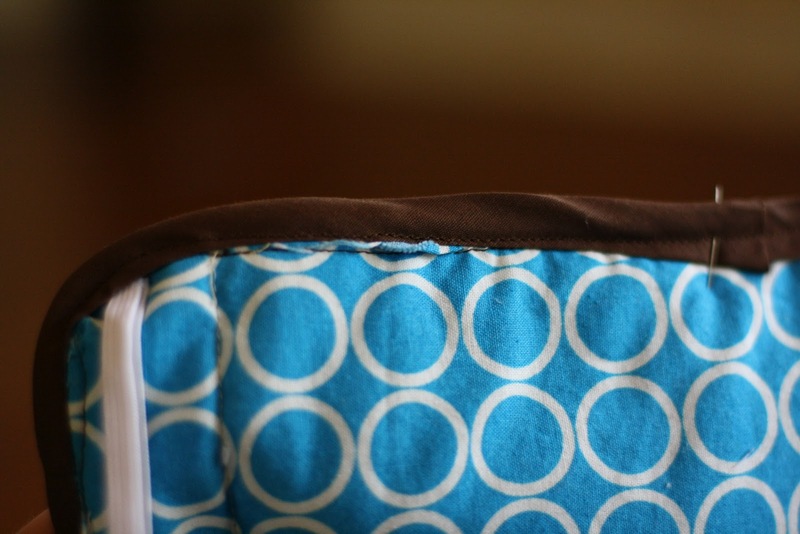 Trim your edges so they are flush with one another. the other four had smaller loops at the end. When you sew these loops, be sure to leave about a 1/4" seam allowance. 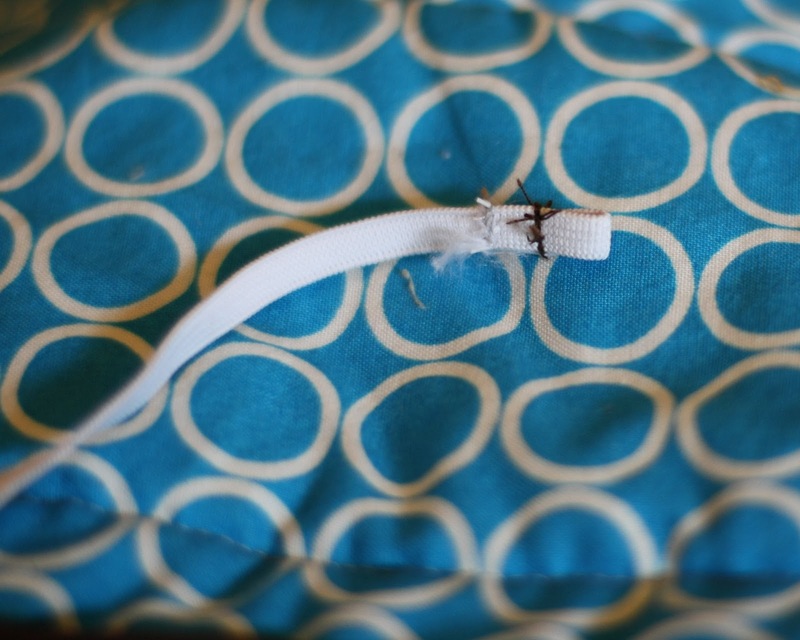 The elastic frayed more than I expected. 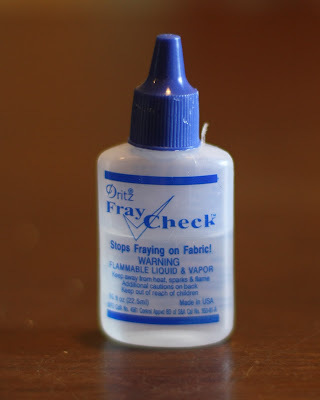 I trimmed off the frayed edge and added some fray check. 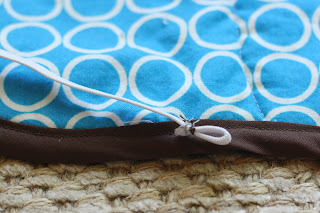 Sew the elastics onto the cover with a 1/4" seam, placing them at the notches. 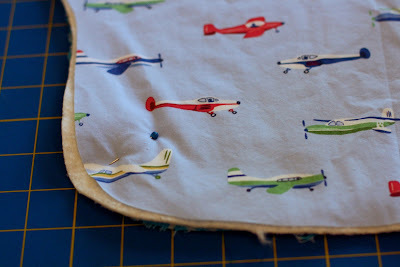 Now it's time to sew on the bias binding. I love this tutorial for that. 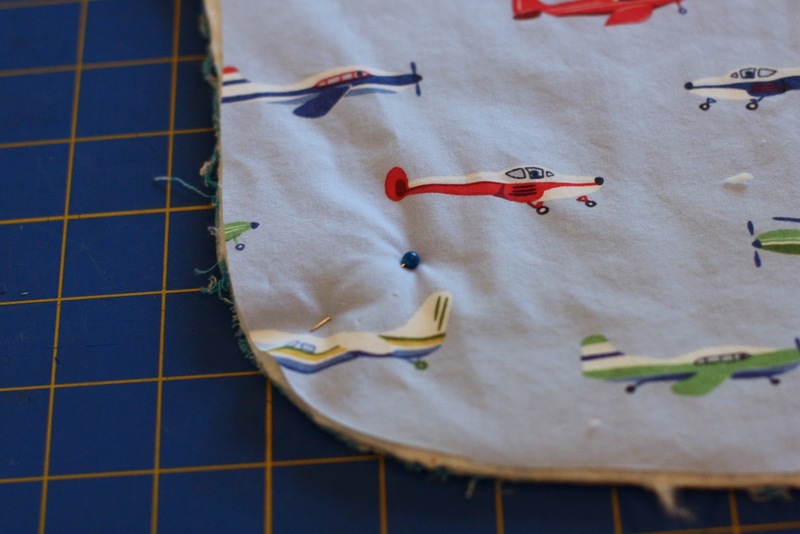 After I sewed on my binding to the front of the cover, I wrapped my binding around to the other side, using pins to be sure it covered my previous stitching. I also pinned my elastic bands up and out of the way, so I wouldn't catch them in my stitching. Oops, I didn't use enough pins and this is what happened. It's okay. I just unpicked my stitches in this area and adjusted the binding so it covered my stitching line. 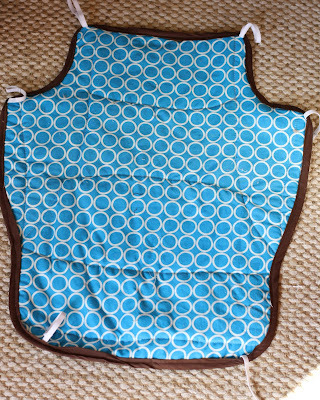 This car seat cover is SO cute! I love it! :) Great job! Thank you for posting this tutorial, it gave me the inspiration/motivation to make one for my daughter's new booster seat. 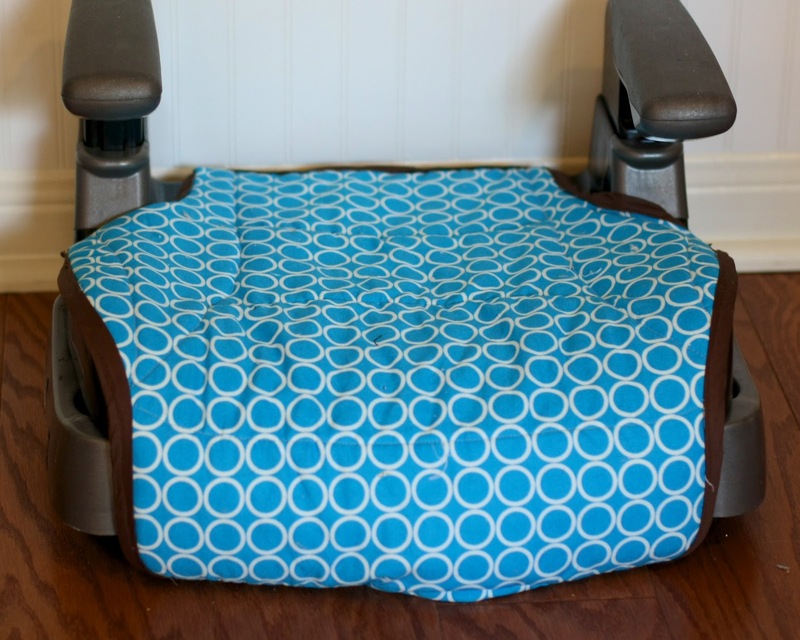 I wanted to make here booster seat a little more unique than the plain black and gray it came with. I am quite happy with how it turned out using most of your methods. Love it! Thanks again! Awesome! I'm so glad it worked out for you! And thank you so much for taking the time to let me know!